What are optical thin film filters? At Iridian we put this basic thin film physics to work by depositing onto substrates (typically glass) optical thin film filters consisting of alternating layers of high and low refractive index materials. Often these layer stacks consist of 10’s to 100’s of individual layers.The individual layer thicknesses are on the order of 10 nm to 1000 nm thick depending on the spectral range of the optical filter(the layers thickness are often ¼ of the wavelength region of interest). The result is selective transmission and reflection of specific wavelength bands dependent on the effective thickness of the film and the layer structure deposited. How are optical thin film filters manufactured? The deposition and substrate materials are selected on the basis of their optical and physical properties for the operating wavelength range of the filter as well as for the ability to be deposited in a controlled and efficient manner and with the requirement that the resultant thin film filter be robust and durable.Dielectric oxide materials are usually the material of choice for visible (350-750 nm) and near- and mid-IR (750-9000 nm) spectral range (for UV and long wave IR wavelength ranges, selenides, sulfides, fluorides and semiconductors are often employed).These coating materials can be deposited by different mechanisms but at Iridian we employ energetic sputtering processes to efficiently produce in a repeatable, high yielding manner, complex, precise and robust filter stacks. Optical thin film filter software is employed by thin film engineers to design the thin film multilayer based on the chosen materials and required optical and physical specifications. 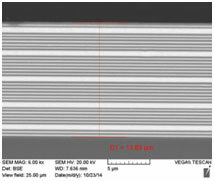 In order to realize the desired optical performance, the optical constants of the deposited thin film materials need to be accurate and the layer thicknesses tightly controlled, typically to within 1 nm, for deposition runs that can last from a few hours to several days. Modern thin film deposition systems employ in-situ optical monitoring to ensure that the layers are accurately deposited;the control software can then automatically adjust subsequent layers based on the in-situ feedback to produce the desired final filter shape. 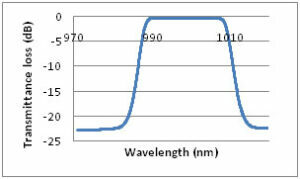 What functions do optical thin film filters perform? Optical thin film filters are designed to transmit, reflect or absorb specific wavelength ranges of light for one or more angles of incidence and for different polarizations of light. At Iridian most of the optical filters that we produce provide “wavelength selectivity” to the devices in which they are implemented; that is they transmit specific wavelength regions and reflect or block others providing “more signal, with less background” to the systems in which they are deployed. What should I look for in selecting a supplier of optical thin film filters? As always a balance of price and performance are first considerations when selecting a supplier. However partnering with an experienced and responsive supplier that is willing to suggest trade-offs and possesses the proven ability to produce many different types of filters helps ensure that the optimal solution will be produced that addresses both commercial and technical needs of your product. It is also critical that your supplier follows and is certified to a quality management system (such as ISO9001:2015) and that they have a team in place to support the filter from initial concept through to volume production if needed. Finding a supplier with the integrity to “ask permission rather than forgiveness” in negotiating upfront deliverables such as performance and lead-time up and that is available to support questions throughout the build and product life-cycle is invaluable. What are the advantages of Iridian’s optical thin film filters? What are the names of the various wavelength ranges? How should I specify custom requirements for an optical thin film filter when requesting a quote? The optical filter specifications required will depend on the filter application and how it is to be used. 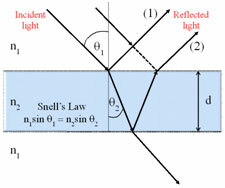 In general, typical filter optical specifications will include the wavelength ranges over which to reflect, transmit or absorb light; angle of incidence tuning range; the polarization state of light for non-normal angles of incidence; light coherency (laser or white light); optical beam size and cone angle of light; desired substrate material (with dimensions); incident light medium (air or glass) and so forth. In additional, physical specifications such as the operating temperature range and the ambient environment of the filter should also be specified. Need to specify: Free Spectral Range (FSR), Finesse (F) and FSR temperature variation. How do I generate a Request For Quotation (RFQ)? You can send your request to [email protected]. Iridian’s sales personnel will get back to you within one business-day with regards to your RFQ. What information is needed for a Purchase Order (PO)? Yes you can order online for any single band fluorescence filter or set, see our NEW Webstore for product listings! We will be adding additonal products shortly and welcome your inquiries for any other items on our website. We can accept telephone orders using VISA cards or standard purchase order for any of our products.